Electronic Security Safe secures valuables, such as keepsakes, collectibles, heirlooms, jewelry from theft and other important items. Features electronic lock with override key and two live-locking bolts, carpeted floor, concealed hinges and armored steel construction for a formidable deterrent against theft and loss. Includes bolt-down hardware for added security. Safe holds .5 cubic feet (16.4 cubic liters). Interior dimensions are 13-5/8" wide x 8-5/8" deep x 8-1/2" high (34-3/5cm wide x 20cm deep x 21-3/5cm high). Weighs 22.9 lb. (10.4 kg.). 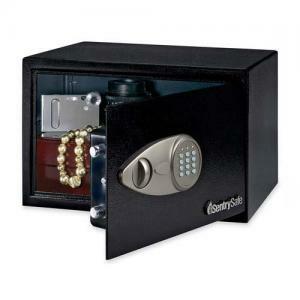 $601FireKing MediaVault Storage Safe - 10.50" x 11.63" x 17.50"
$89Sentry Safe Security File - 13.60" x 15.30" x 12.10"